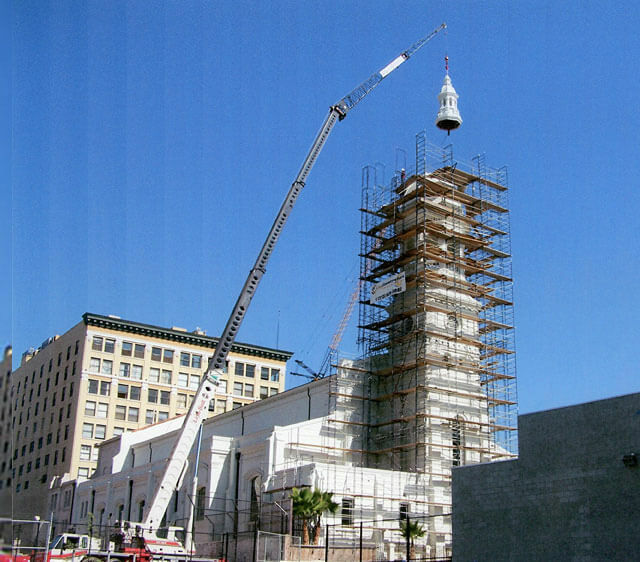 Purple Crane has provided expert, affordable lifting services for Southern California construction projects since 1983. We can assist you with almost any commercial or home construction project, including remodeling. Our crane operators are fully certified professionals, and they use only state-of-the-art mobile cranes, ranging from 3-ton to 75-ton capacity. In addition to handling heavy loads, our cranes can lift as high as 165 feet, or 12 stories. We can also offload trucks and lift and stack heavy items into place, such as construction steel, wood, trusses, beams, columns, and rebar. If you need transportation help with your construction project, we even rent heavy-duty trucks and trailers, and we can transport your items anywhere in Southern California, including to a scrapyard or another job site. At Purple Crane, we guarantee that we will send the correct crane on time, the first time, every time. Our accurate, timely service will help keep your project under budget by preventing unnecessary delays. Being able to rely on expert crane service will also mean there's one less thing you have to worry about. Call us today to find out more about our full range of services and competitive rates. With a work history of over 75,000 lifts and the capacity to handle both light- and heavy-duty jobs, Purple Crane is Southern California's best choice for construction project crane rental. A live operator is standing by 24 hours a day, 7 days a week to take your call. With Purple Crane, you can always expect prompt, high quality service at a great value.